It’s scary to see just how many business owners there are that still see social media as something for kids, but then spend thousands of dollars on a TV spot where they have little way of knowing the reach and success of the TV spot. Social media is becoming an indispensable part of the marketing mix for many businesses and one of the best ways to reach customers and clients. Social media is becoming an indispensable part of the marketing mix for many businesses and one of the best ways to reach customers and clients. 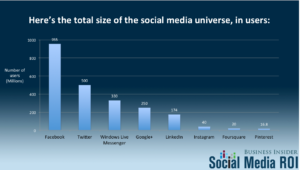 Social media platforms are playing a bigger role in businesses these days. The benefits for companies of social media are many and creating “the past’s” media marketing is expensive. Companies are spending a ton of money on TV ads, brochures, flyers and billboard ads with very little knowledge of the reach and if it hits the targeted audience. Social media is a fun, easy way to market your business and reaching the correct audience. But what is the Benefits of social media for businesses? Consequently, the potential customer has to “find” the ad and not the other way around. On social media, it is usually the opposite. If the business has done a great job, the business will be able to find the people. And not only the people-the RIGHT people who are genuinely interested in your business. By using social media, you have the ability to reach the whole world with just a few taps-completely free! Back in the days when social media didn´t exist, it was hard for smaller businesses to be able to afford marketing. Today however, with social media, businesses have a completely different possibility of marking their business at a very low cost or no cost at all except time spent. Unlike marketing in newspaper, television or billboards, with social media, you have unlimited access to posting as much content as you like. Without a fee on every single marketing post, status update or product photo, there are very few reasons to why you should take advantage of it. Social media is a world full of millions and millions of users. There will, of course, be people on there that have the same interests as you or maybe have the skills that you are looking for. On social media, you have the possibility of finding anyone and everything to please your needs and help you grow your business. This will not only save you time but also make the customers more happy because of faster replies. Social media can also help you in terms of market research. You can ask your followers think of this and that and create a better understanding of the customer´s demand but this is just some of the Benefits of social media for businesses. Social media can also be a great way to easily evaluate competitors as well, by being able to monitor their pages within the insights page. We can easily competitors’ strategies by the types of content they post and also see the effectiveness of it through viewing their engagements and page likes. Not only great for the own business benefits but social media is also a valuable tool to assess and beat the competition. There you have it! Hope you have learnt at least something from the article Benefits of social media for businesses. If you have any further questions, comment below! Feel free to also read Common social media mistakes, Which social media platform should you choose? and does social media marketing give any results?